Drew McDonald (34) cuts off his portion of the net after the Norse secured 1st place in the Horizon League. 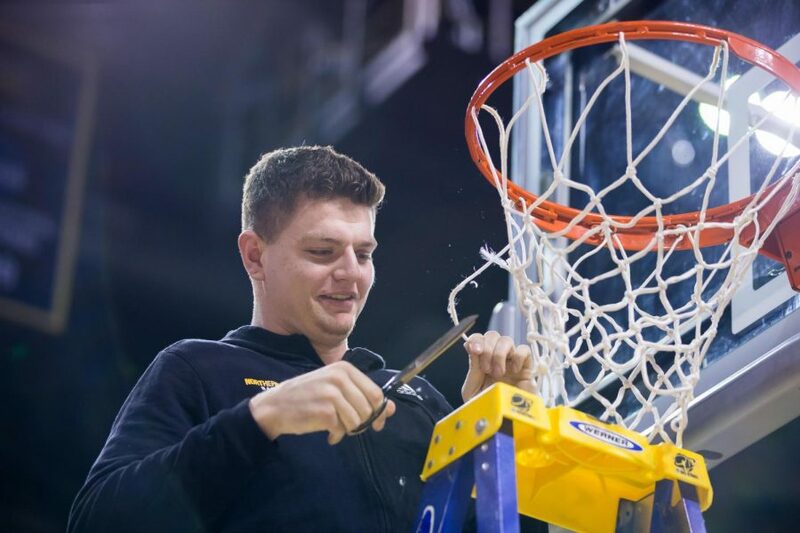 After a steak dinner and a joyful bus ride home, the Northern Kentucky University men’s basketball team cut down the nets in BB&T Arena after clinching the Horizon League regular season title in a 75-56 win against IUPUI. The victory topped off a season that saw the Norse collect 22 wins, 15 of them coming against conference opponents. Originally, head coach John Brannen thought it would be a private team ceremony, but around 4 p.m. on Sunday he tweeted out that the ceremony would be a public event. While a regular season title doesn’t guarantee the Norse a spot in the NCAA Tournament (unlike Power Five conference schools), Brannen considers it an even more impressive accomplishment than winning the postseason tournament. During the ceremony, about 100 family, friends and fans gathered around as each player cut (with varying degrees of success) a piece of the net away from the basketball rim. McDonald was the first player to cut the net. Drew McDonald (34) hugs his mother before the net cutting in BB&T Arena after securing 1st place in Horizon League. After the net on the first basket came down, the players moved to the next basket, where Lavone Holland took a different approach and cut the bottom half of the net off instead of cutting a strand from the top. In his final season for the Norse, Holland said one of the team’s season goals was to win the regular season title. Holland has been a difference-maker the last few games for NKU, scoring 25 points against UIC on Friday and tallying 17 points against IUPUI on Sunday. The Norse will now begin preparing for the Horizon League tournament in Detroit. They’ll play their first game on Saturday against the winner of the Youngstown State/Cleveland State matchup on Friday. Tip-off on Saturday is scheduled for 8 p.m. on ESPN3.